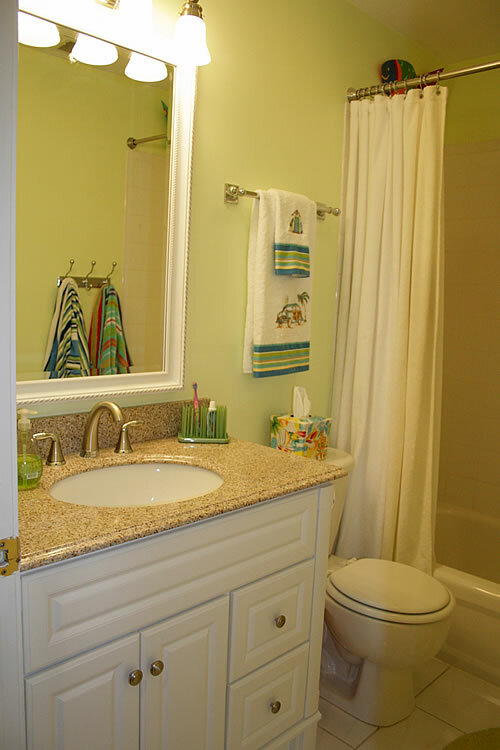 Making a Small Kids Bathroom Work | Your home, only better. There are always concessions made when picking your next home. 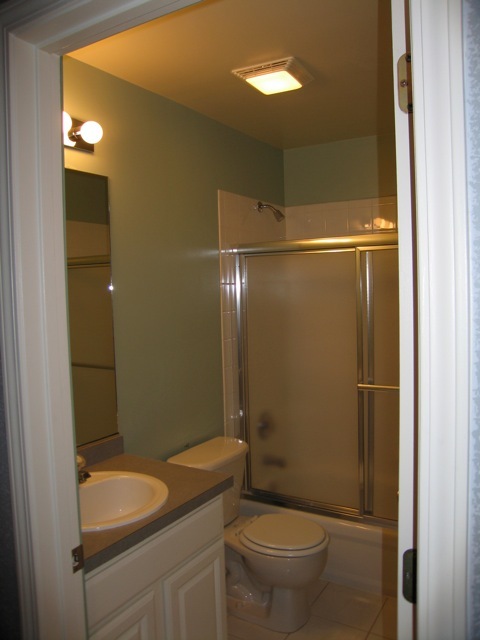 In our case, it was the smaller kids bathroom, which also has to serve as a guest bathroom at times. Not only was it functionally-challenged, it was just darn ugly. There. I said it. Small 31” vanity with precious little countertop space and storage. The Formica countertop was as ugly as the rusted out sink. The only towel bar was hung above where the kids can easily reach. 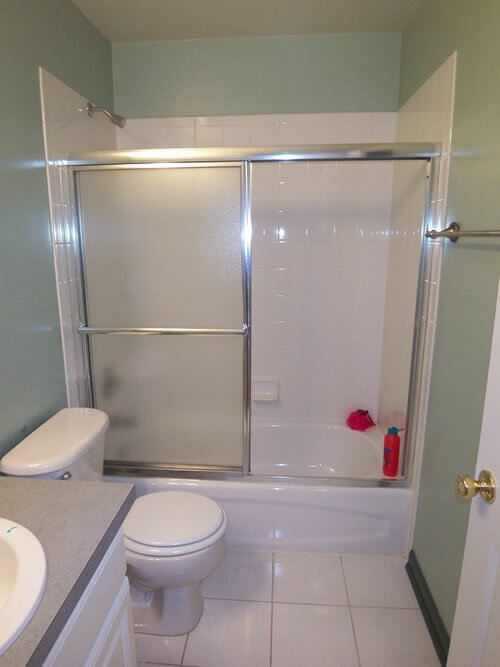 The dated (and sort of grimy) shower door on the tub made the space feel even smaller. Dated green walls with dark green trim and back-of-door. 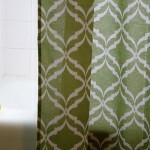 We tore down the shower door, making the space feel larger (and cleaner!). I used Goof Off and a positive attitude to remove the caulk (hint…you have to want to win bad enough…but stick with it…it’s doable). 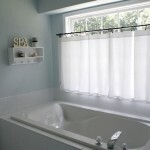 We used an existing white terry cloth shower curtain, with simple chrome hooks. This small space can’t handle alot of distraction! There was a bit more room available between the vanity and toilet to work with, so we opted for a standard 36” vanity with two drawers rather than the 31″ cabinet already there. More counter space (and drawers) is a good thing! By going with “standard” sizes, we were able to pick up an affordable granite countertop with under-mount sink included for under $200. We selected a faucet with a chrome and brushed nickel finish to match many décor visions down the road. The mirror and light was the very typical builder-grade plain mirror. We replaced the mirror with a lovely one found at HomeGoods. Because we went with a wider vanity, we had to re-center the lighting over it to fit. 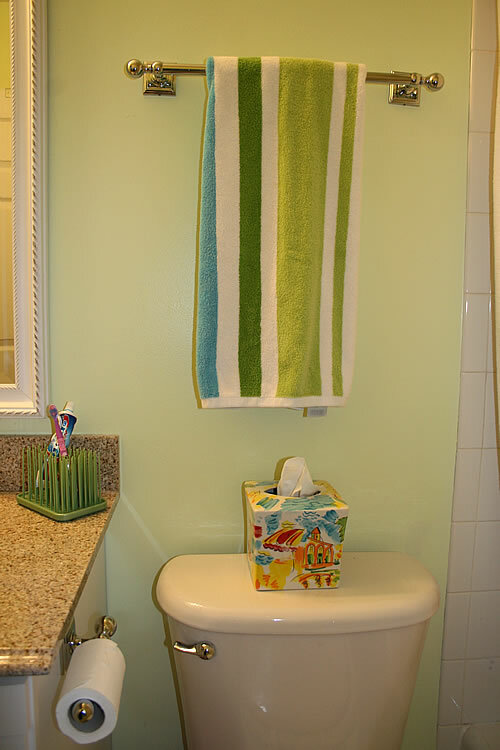 We painted the walls a light celery color (Behr Sheer Green) to brighten the space. Not only does it liven the space, but it matches the accessories we already had. 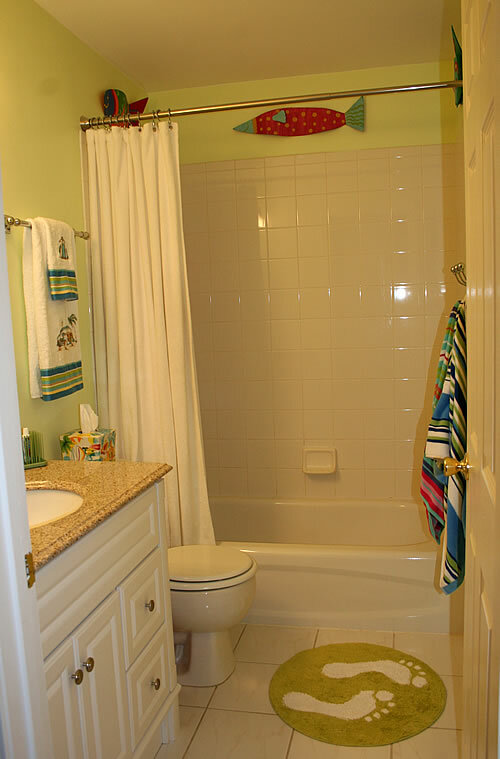 Because it is a small space, we limited the wall décor to above the shower to draw the eye all the way to the far wall. I picked up these metal 3D fish from HomeGoods a few years ago. 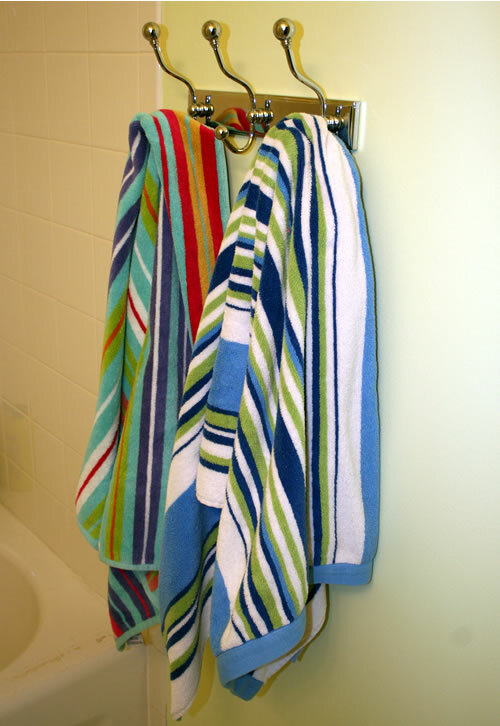 We picked up chrome wall hooks, a towel bar and TP holder (also from HomeGoods) at a great price, and used existing colorful stripped towels to organically provide the rest of the wall décor (form and function fun!). Mismatched brings more color in the room, and let’s each kid know which towel is hers. Plus its easier for them to hang them back up. 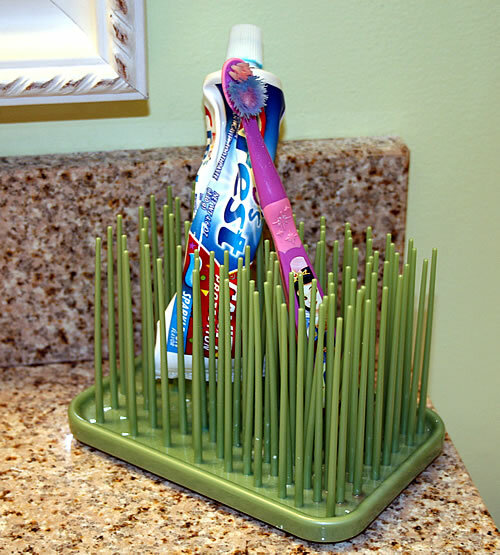 We found these darling Umbra “grass” toiletry holders on Amazon. The kids love them! And I love that they’re not as messy. The work for office supplies too. Exactly were aare your contact details though? 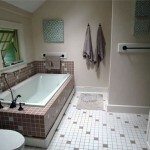 Great ways to remodel. They look formidable. Oh funny – I was going to a post on kids bathrooms too but others got in front of it. I like the red arrow – I throw arrows on my posts to when I can. Nice. 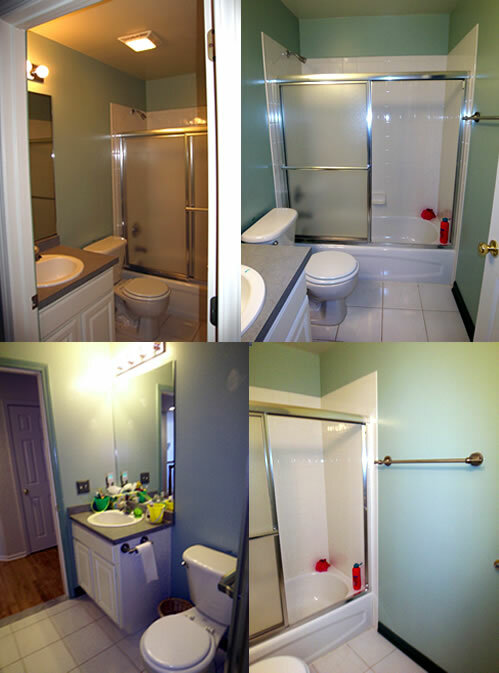 I got lot of ideas from you , the way you have transformed the kids bathroom. 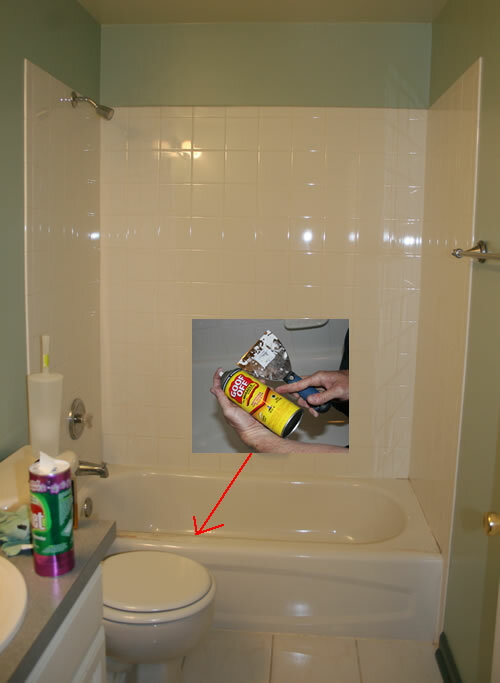 Maintaining kids bathroom is very difficult.